Maurizio Sarri condemns the alleged racist abuse of Raheem Sterling by Chelsea supporters but wants the club's main focus to be on Thursday's clash with Vidi. The Blues visit Budapest this week for their final Europa League group match, having already secured qualification to the last 32 in top spot. It will be Chelsea's first game since their 2-0 victory over Manchester City at Stamford Bridge last Saturday, during which Sterling was allegedly the target of racist shouts from some fans in the home section. 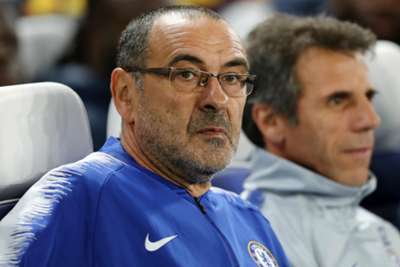 Chelsea banned four individuals from attending their matches pending further investigations into the incident, and Sarri, although keen to express his contempt for any form of discrimination, wants to concentrate on football and not the future behaviour of supporters. "First of all, I want to say that I condemn any form of discrimination, of course," the head coach told a news conference. "I have to stop here, because there is an investigation, so it is better not to say something more. I condemn every sort of discrimination. "I would like to speak about the match. Otherwise, it is impossible to go on, I think. I can only answer in one way, like I have answered to the first question. I think there is nothing else to say. "I think it was disgusting, you know my opinion and the club; now we have to go on and talk about the match. It is a difficult one to prepare for as we don't have a material target." Sarri was unwilling to give much away about his team selection for Thursday's game, although he expects a difficult test against a team who must better BATE's result in order to progress. However, he did confirm he plans to rest key first-team players including Eden Hazard, N'Golo Kante and goalkeeper Kepa Arrizabalaga. "The last match was very difficult. It was difficult to score," he said. "They are fighting for qualification, but I think they need to win. It might be different. "I don’t know the starting XI. I decided the players that played for three matches in six days in the last week have to rest in this match. I am talking about Kepa, [Antonio] Rudiger, [Cesar] Azpilicueta, Kante and Hazard. "Then, we have three injuries: [Mateo] Kovacic, [Gary] Cahill and [Victor] Moses. All the other players are here."